The OMNI-A0258 is a vertically polarised omni-directional monitoring antenna consisting of an active antenna array, covering 20 to 9000 MHz. 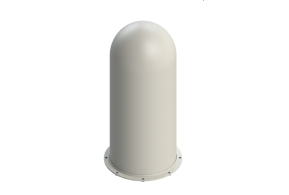 The antennas are combined under a single compact radome and output either in a single (OMNI-A0258/-01) or two (OMNI-A0258-02) connectors. In the active versions of the antenna the active part protects the system from excessive field strengths and boosts low level signals. The active version of the antenna relies on DC power injection on the output port of the antenna. The antenna is best utilised with the MISC-A0080 power supply for this purpose. The OMNI-A0258-01 features a passive-bypass mode which is engaged when the antenna is not powered. In this mode, the antenna is completely passive, allowing for low distortion measurements in the presence of high incident fields. The antenna features lightning protection measures against induced surges on the RF feeder cables as well as ESD protection. The rugged design of the antenna allows it to be deployed on vehicle platforms.